The Horror Movie BBQ: 6 Great Things About Survivor Series 1991! No matter how old I get, I always look back with fondness on certain wrestling events. Especially when it comes to certain seasons. Winter? I get nostalgic about Royal Rumble. Summer? Well, obviously Summerslam. Spring? You best believe I'm sitting back and waxing nostalgic about Wrestlemania's of the past with friends! 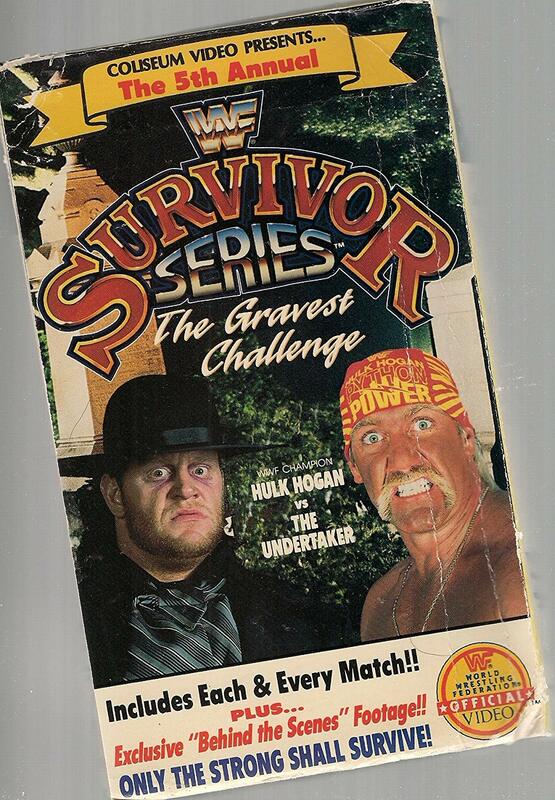 But Thanksgiving holds a special place in my heart for wrestling just as much as it does the parade because as a kid, I could spend Thanksgiving night(or sometimes Thanksgiving eve) with my favorite pro wrestlers and soak in the madness that was The Survivor Series. And none got me more hyped than the 1991 Survivor Series event! A little background before I continue. 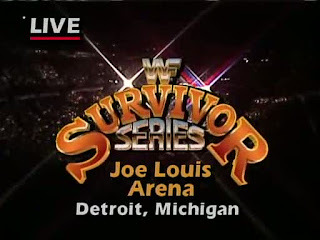 This was the FIRST Survivor Series to not take place on Thanksgiving Night but on Thanksgiving eve. Which works just as well. Still plenty of time to discuss the events at the big dinner table the next night. Of course, at that time, I would've rather had wrestling than football, but that's me. I'm selfish. Now though? I love seeing it take place Thanksgiving week. It still feels right. 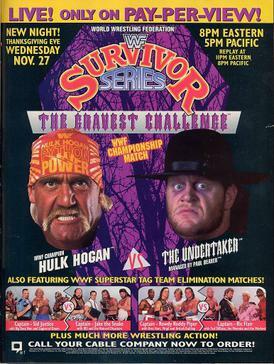 After the Undertaker debuted the year before, Survivor Series started having a very dark atmosphere. Storylines had more serious themes and played out more like thrillers than previous years. Whether it was the intriguing draw of Undertaker vs. Hulk Hogan, the ramifications of Jake Roberts using his snake to bite Randy Savage's arm to the posters and advertisements and even the colors of the event. This was no longer the happy event that revolved around teams fighting each other in non-canonical battles. Shades of grey would take over it and advanced storylines that would effect the company for years would become more common place. Up to this point, we'd see a few teases to a Rockers break up but this really drove the point home that a rift between the two was happening. Shawn Michaels was destined to be a singles star and on this night, one false move from his partner Marty Jannetty caused the future star to be eliminated from their team of 4. This, kayfabe wise, caused Shawn to make the decision to move on and later on in the next few weeks, kick Marty right through a window on the set of The Barber Shop. Hulk Hogan's popularity was on the downturn. The audience had seen all they needed to since 83 and ready to move on. This was the beginning of the end for Hogan's run in WWF. With The Undertaker crowned as the new WWF champion (thanks to help from Ric Flair), Hogan's run as "the immortal one" would slowly come to an end. The Undertaker would hold the title for only a few days until their next event, This Tuesday In Texas until he dropped it back to Hogan but to see such a frightening sight as Taker walking out with the title, was quite haunting and gave any young Hulkamaniac a supreme case of anxiety. Times were changing and would only get darker. While the focus of this show shifted from teams to the big title match and the hype of the next show, one of my favorite Team Matches took place. Opening the show was Team Roddy (Roddy Piper, Bret Hart, British Bulldog and Virgil) vs. Team Flair (Ric Flair, The Mountie, The Warlord, Ted Dibiase) in a fun match, which saw everyone being eliminated except the dirtiest player in the game, Ric Flair. There are other team matches in this show, but this particular one had a lot more going on. All 8 men had an issue to settle with their rivals and some even continued for months. Jake Roberts went from hero to cold blooded villain over the summer of 1991 by siding with The Undertaker and attacking both The Ultimate Warrior and even ruining Randy Savage and Elizabeth's wedding reception. The latter would lead to a feud between The Snake and The Macho Man, which would then lead to a segment on WWF Superstars where Jake would use his King Cobra to bite Randy's arm in full graphic detail. As an 8 year old watching this go down on tv, I was frightened beyond belief. I had never seen or expected to see Jake actually use his pet snake to bite someone! This interview with Jake, taking place less than a week after this famous segment, sent home just how chilling and cold Jake had become, even revealing his hopes Randy would bring Liz ringside for the next event. Earlier in the show, Randy Savage had come out to for a promo in which he brought his wife, Elizabeth. His promo essentially warned Jake Roberts what he was going to do the next week in Texas. After being "retired" by The Ultimate Warrior months before, Randy was ready to return and get revenge on Jake for all the hell he and Elizabeth had been put through. Their wars would become very memorable and some of the best from that era. Back in the late 80s/early 90s, you wouldn't get a PPV on VHS for a few months but man was it worth that dreadful wait. If you were like me and only able to LISTEN to the event through the static, then you know just how important and huge of a deal it was to finally watch the event. On top of that, this cover itself was that of a horror movie, so the intrigue of watching this event from beginning to end was dialed up to about an 11. As a kid, this was one of the very first events I truly got hyped for and helped establish my love of this event. Sure, the team competition theme became secondary for a while, but I still get excited for it. The modern era of "Raw vs. Smackdown" theme fits it as well and still provides a lot of fun memories. I can't wait to watch the big event tonight!